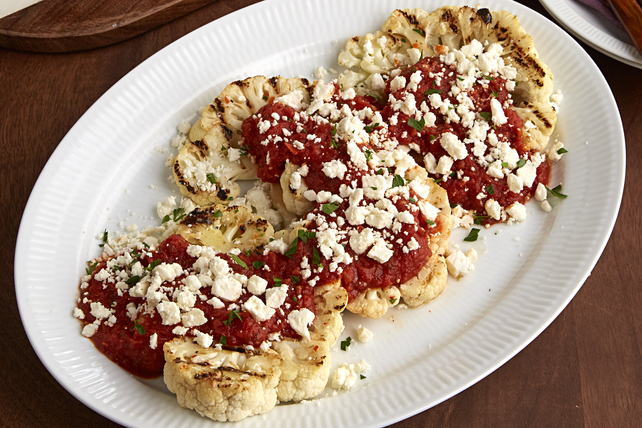 Discover an alternative to steak with our Grilled Mediterranean Cauliflower "Steaks" recipe. Flavoured with a red pepper pasta sauce, these grilled cauliflower 'steaks' are amazing! Heat barbecue for indirect grilling: Light one side of barbecue, leaving other side unlit. Close lid. Heat barbecue to 350ºF. Cut cauliflower lengthwise into 1-inch-thick slices; brush evenly with half the dressing. Place, dressing sides down, over lit side of barbecue. Grill 2 min. ; turn. Brush with remaining dressing; grill additional 2 min. Transfer cauliflower to unlit side of barbecue; grill 10 to 12 min. or until tender. A few minutes before cauliflower is done, cook pasta sauce in saucepan on medium-low heat until heated through, stirring frequently. Serve cauliflower topped with pasta sauce, cheese and parsley. Sprinkle with chopped olives before serving.